both are fully situated in AchArya nishtai. madhurakavi AzhwAr is fully situated in the lotus feet of nammAzhwAr and ananthAzhwAn is fully situated in the lotus feet of emperumAnAr. Subsequently, while giving lectures on the nectarean pAsurams of thiruvAimozhi, emperumAnAr started explaining “ozhivil kAlamellAm” padhigam (3.3) where nammAzhwAr reveals his great desire to perform pure and constant service to thiruvEnkatamudaiyAn. In that padhigam, AzhwAr reveals the liking of thiruvEnkatamudaiyAn for fresh and abundant flowers. emperumAnAr, contemplating on AzhwAr’s divine desire, posts a question to his audience “Is there any one who will go to thirumalai, make a beautiful garden and serve emperumAn with beautiful flowers everyday?”. ananthAzhwAn, at once raises upto the occasion and says he will fulfill AzhwAr’s and emperumAnAr’s desire. emperumAnAr becomes mighty pleased and ananthAzhwAn immediately takes leave to thirumalai. He first performs mangaLAsAsanam to thiruvEnkatamudaiyAn, prepares a garden and names the garden “irAmAnusan” and starts serving fresh flowers to emperumAn everyday. Hearing this, emperumAnAr decides to visit thirumalai and have dharshan of the same. He quickly completes his thiruvAimozhi kAlakshEpam (lectures) and leaves to thirumalai. He arrives at thiruppathi via kAnchipuram (after performing mangaLAsAsanam to dhEva perumAL and thirukkachi nambi). ananthAzhwAn and other srIvaishNavas come down and welcome emperumAnAr. 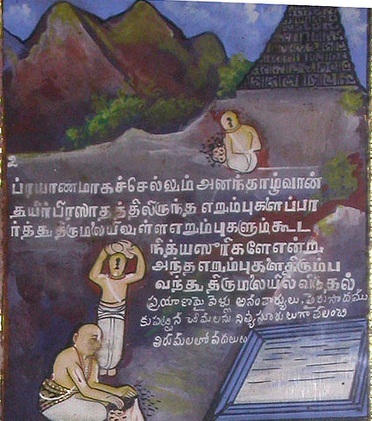 emperumAnAr first refuses to climb on thirumalai saying that thiruvEnkatam hill is a form of AdhisEshan himself. But after his sishyas prolonged requests saying that if emperumAnAr does not climb the hill how can they climb the same, emperumAnAr agrees and with utmost devotion climbs the hill. thirumalai nambi himself comes to the entrance of thirumalai and welcomes emperumAnAr. emperumAnAr then visits the garden “irAmAnusan” that is maintained by ananthAzhwAn and seeing the great variety of fresh flowers he feels blissful. As stated by thirumangai AzhwAr “vaLarththathanAl payan peRREn” (parakAla nAyaki declares that she was pleased/honoured by nurturing her pet parrot since the parrot repeats emperumAn‘s names/charithram), emperumAnAr also becomes very pleased by ananthAzhwAn’s utmost dedication. Once, when ananthAzhwAn and his pregnant wife was working on making a pond for the garden, emperumAn himself appears as a small boy and tries to help him. ananthAzhwAn wanting to fulfill his AchAryan’s instructions on his own rejects the boy’s help. ananthAzhwAn’s wife accepts the boy’s help in absence of ananthAzhwAn. Coming to know about that, ananthAzhwAn becomes very angry and he starts chasing the buy and finally throws his crow-bar on the boy. The crow-bar hits the chin of the boy but the boy vanishes into the temple. thiruvEnkatamudaiyAn‘s chin itself looks hurt and that is why even today pachai karpUram (camphor) is applied on thiruvEnkatamudaiyAn’s chin to cool down the wound. Once when ananthAzhwAn was bitten by a snake. When his associates become worried, he simply says if the snake that bit me is more powerful, I will give up this body and serve emperumAn in paramapadham after bathing in virajA river. If the snake that was bitten (my body) is more powerful, I will continue my kainkaryam here in thiruvEnkatam after bathing in the pushkariNi here. Such was his attachment to kainkaryam, he did not care a bit for his body. Once when ananthAzhwAn brought a bag of prasAdham from thiruvEnkatam during a travel to a nearby town. When he opens the bag of prasAdham, he notices some ants, he at once instructs his sishyas to leave them back at the hill. He says “since kulasEkara AzhwAr has declared that he (and other devotees of emperumAn) wants to be anything on thirumalai, this may be him, so we should not disturb their life on thiruvEnkatam”. Once when ananthAzhwAn was making a garland, thiruvEnkatamudaiyAn sends some one to summon ananthAzhwAn at his sannidhi. ananthAzhwAn arrives late after completing his kainkaryam of making the garland. thiruvEnkatamudaiyAn asks why he was late and ananthAzhwAn replies “while the flowers are blooming I want to make the garland, I have nothing else to do in this sannidhi other than my kainkaryam as ordered by emperumAnAr“. emperumAn then asks “What if I ask you to leave this place then?” and ananthAzhwAn replies “You arrived at thirumalai a little before me and I came here at the orders of my AchAryan. How can you ask me to leave?”. emperumAn was very pleased to see the great AchArya nishtai of ananthAzhwAn. ananthAzhwAn’s instructions and glories are identified in various places in the vyAkyAnams. Let us see some of them now. periyAzhwAr thirumozhi 4.4.1 – maNavALa mAmunigaL vyAkyAnam – In this pAsuram, AzhwAr glorifies the srIvaishNavas of thirukkOshtiyUr that they wont utter any other words than what is dear to their AchAryan. mAmunigaL reveals ananthAzhwAn’s attachment towards bhattar (even though bhattar is much younger to him). During his final days, ananthAzhwAn asks some srIvaishNavas which name is dear to bhattar. They reply that bhattar has great attachment to namperumAL’s name “azhagiya maNavALan”. ananthAzhwAn then says “Though uttering husband’s name is improper etiquette, since bhattar likes this name very much I will also say it” and says “azhagiya maNavALan” and ascends to paramapadham. Though ananthAzhwAn wanted to say emperumAnAr‘s name before ascending to paramapadham, because he heard the liking of bhattar for “azhagiya maNavALan” he took up to that. nAchiyAr thirumozhi 7.2 – periyavAchAn piLLai vyAkyAnam – In this pAsuram, ANdAL explains that pAnchajanyam was born in the ocean but ended up reaching the divine hands of emperumAn. To explain this periyavAchAn piLLai highlights an incident involving ananthAzhwAn and nanjIyar. vEdhAnthi after being reformed by bhattar, divides his wealth in to 3 parts, gives 1 part each to his two wives and brings 1 part to his AchAryan (bhattar). He also eventually accepts sannyAsam and comes to srIrangam to serve his AchAryan. Hearing this ananthAzhwAn tells him “You were nicely situated in gruhasthAshramam, you could have just continued there with the true understanding about spiritual matters and served your AchAryan and bhAgavathas and eventually could have ended up any way in paramapadham. Why did you accept sannyAsam?”. Other srIvaishNavas asked what to do then? ananthAzhwAn then explains that one should be born in thirumanthram (true knowledge parmAthmA, jIvAthmA and their relationship) and be nurtured in dhvaya mahA manthram (understanding that emperumAn is both upAyam (process) and upEyam (goal)) and live their life accordingly. nAchiyAr thirumozhi 12.5 – periyavAchAn piLLai vyAkyAnam – In this pAsuram, ANdAL explains how all the gOpas and gOpis where fainting immediately after seeing kaNNan emperumAn dancing on kALiyan the snake. ananthAzhwAn was travelling with srI nambi guha dhAsar to meet emperumAnAr. While reaching srIrangam, they see some EkAngis (kainkaryaparars) of emperumAnAr who had shaven heads and were coming out of cauvery after bathing. When enquired they inform that emperumAnAr has left this world and went to paramapadham. Hearing this, nambi guha dhAsar climbed a near by tree wanting to jump off the same and commit suicide. At that time ananthAzhwAn says to nambi that since you did not give up your life as soon as you heard about emperumAnAr’s ascending to paramapadham, even if you jump off the tree you wont die, you will only break your legs. This incident beautifully relates the attachment of gOpas and gOpis towards krishNan. 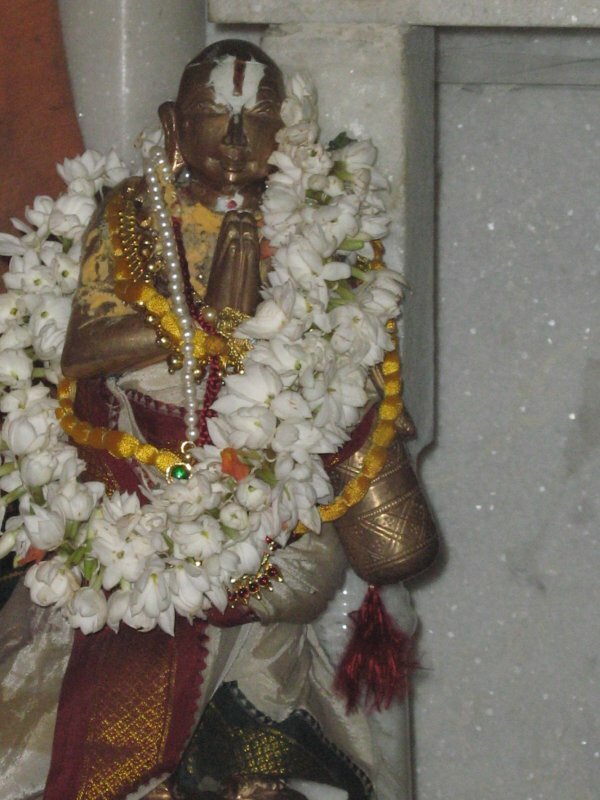 perumAL thirumozhi 4.10 – periyavAchAn piLLai vyAkyAnam – In this padhigam, kulasEkara AzhwAr manifests great attachment towards thiruvEnkatam. He declares that he just wants to become something on the divine hill. 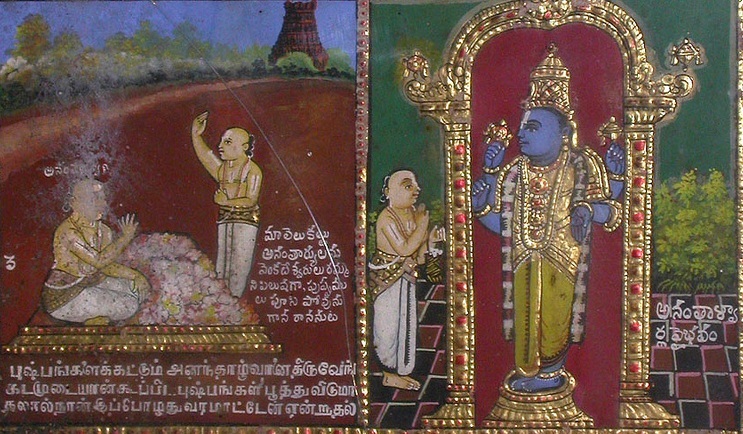 ananthAzhwAn explains that he would even not mind becoming thiruvEnkatamudaiyAn himself so that there is some connection with the divine hill. periya thirumozhi 5.5.1 – periyavAchAn piLLai vyAkyAnam – In this padhigam, thirumangai AzhwAr as parakAla nAyaki cries out for thiruvEnkatam saying “vEnkatamE vEnkatamE” showing her great attachment for the dhivya dhEsam. nanjIyar identifies that this is similar to bhattar calling out namperumAL as “azhaghiya maNavALan” and ananthAzhwAn calling out srInivAsan as “thiruvEnkatamudaiyAn” – their full attachment towards those names get fully revealed by their calling out. 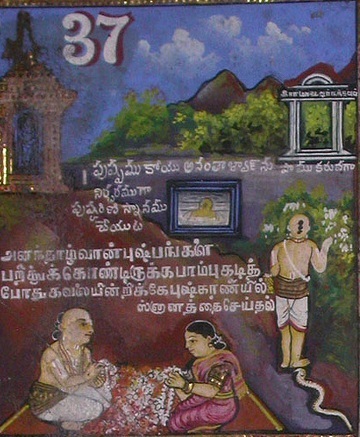 thiruvAimozhi 6.7.1 – nampiLLai eedu vyAkyAnam – In this padhigam, nammAzhwAr shows great attachment to vaithamAnithi emperumAn and thirukkOLUr dhivyadhEsam. nampiLLai identifies an incident where ananthAzhwAn highlights the importance of staying in ones own dhivyadhEsam and serving the emperumAn right there. 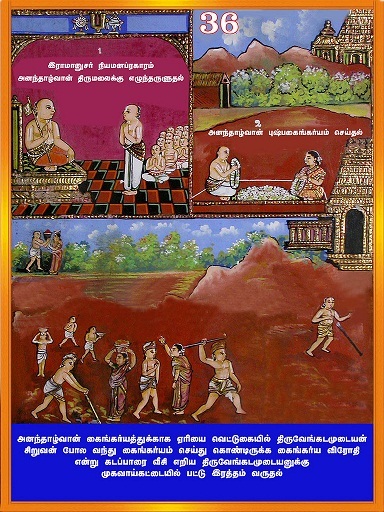 ananthAzhwAn once meets a srIvaishNava who is living and doing farming in a village named chOLA kulAnthakan. He asks where the srIvaishNava is from and the srIvaishNava says that he is from thirukkOLUr. ananthAzhwAn then asks him why he left his native place. The srIvaishNava replies he was unable to find a job there so he left from there. For that, ananthAzhwAn replies, you could have herded some donkeys and earned some money and continued staying in thirukkOLUr which is very dear to emperumAn and nammAzhwAr and served them there instead of coming here and doing farming here in this village. He highlights that for the jIvAthmA while in this world, its best to be in a dhivyadhEsam amidst srIvaishNavas and engaged in kainkaryam. thiruvAimozhi 6.8.1 – nampiLLai eedu vyAkyAnam – In this padhigam, nammAzhwAr as parAngusa nAyaki sends a bird as messenger to emperumAn to convey her deep sorrow in separation. At that time AzhwAr says he will give both this world and paramapadham to the bird for being his messenger (since parAngusa nAyaki is emperumAn’s nAyaki/consort, she owns everything owned by emperumAn). When some one asks if parAngusa nAyaki gives everything to the bird, where will she stay?, ananthAzhwAn replies “she will stay in a place that is given by the bird itself” in a beautiful way. thiruvAimozhi 7.2.9 – nampiLLai eedu vyAkyAnam – In this pAsuram, nammAzhwAr says “en thirumagaL sEr mArban” about emperumAn – that he is the abode of srI mahAlakshmi. ananthAzhwAn names his daughter “en thirumagaL” out of great attachment to AzhwAr’s divine words. vArthAmAlai – 345 – bhattar once sends one of his sishyas to ananthAzhwAn to find out how a srIvaishNava should conduct himself. He goes to ananthAzhwAn’s thirumALigai and reaches there during thadhIyArAdhanam. Since the place was full, he waits until every one eats. ananthAzhwAn spots him and invites him to accept prasAdham with him in the end. ananthAzhwAn then enquires about the srIvaishNava and the srIvaishNava mentions that he is a sishya of bhattar and bhattar sent him to find out how a srIvaishNava should be. ananthAzhwAn says “srIvaishNava should be like a stork, hen, salt and you”. Stork usually waits for the best fish and just picks that. Similarly, srIvaishNavas should depend on bhagavAn for everything and just accept bhAgavatha kainkaryam which is the biggest benediction. Hen kindles the dirt and picks up pieces of rice from there. Similarly, srIvaishNavas should search through sAsthram (which contains many details for variety of people) and pick up valuable principles like paragatha svIkAram, bhAgavatha kainkaryam, etc and follow them. Salt mixes with food items in a subtle manner and makes the food delicious. Also, absence of salt is easily noticeable. Similarly, srIvaishNavas should subdue subdue their egos and bring happiness into other srIvaishNavas lives due to their presence. And they should conduct themselves that in their absence every one is thinking about the good deeds of them. Finally, you (the srIvaishNava who asked this question) came here, waited for everyone to have prasAdham and submissively inquired me about the most important principle. Similarly, srIvaishNavas should also look out for others’ happiness and be submissive in their actions. 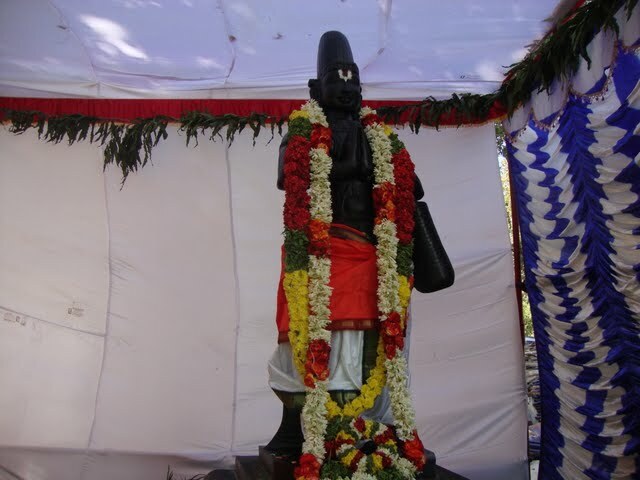 ananthAzhwAn is honoured by thiruvEnkatamudaiyAn even today. Both during his appearance day (chithrai/chithrai) and thIrtham day (thiruvAdi pUram), thiruvEnkatamudaiyAn visits the garden of ananthAzhwAn and gives his own garland and srI satagOpam to the maghizha tree (under which ananthAzhwAn’s divine form was cremated) in the garden. Thus, we have seen some glimpses of the glorious life of ananthAzhwAn. He was fully situated in bhAgavatha nishtai and was very dear to emperumAnAr himself. Let us pray at his lotus feet that we too get a little bit of such bhAgavatha nishtai. ananthAzhwAn’s works can be downloaded from http://acharya.org/anandazhvar/index.html. 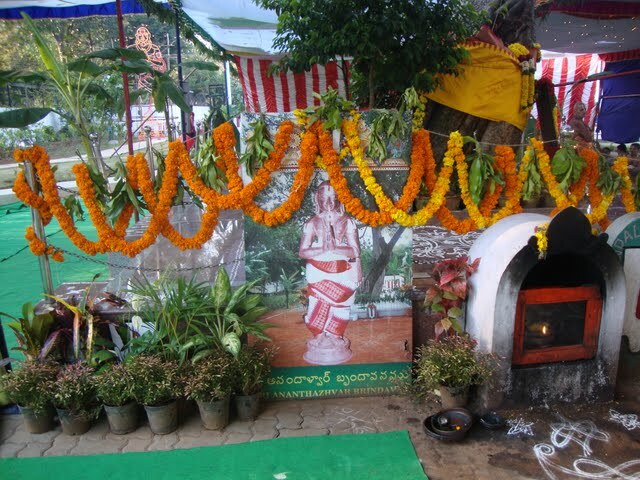 This entry was posted in other AchAryas on March 31, 2013 by sarathyt.